Storberry is now available for digital download through Amazon.com. Jen Barrows, sixteen, believes something wicked hides within the crawlspace above the old garage. Her best friend, Tom, fears the dark forest at the edge of town. Instinct proves reliable. When a strange wind storm cripples the town, something horrible follows in its wake to walk among the shadowed backyards of Storberry after nightfall, changing all that it touches forever. Driven by a promise to protect each other and avenge personal tragedies, Tom and Jen align themselves with a former school teacher, who knows the truth behind the legendary forest, and a town stalwart, who first discovers the creature stalking the night. Page by Page, the terrifying threat of the creature escalates. Set in 1987, Storberry is a welcome return to old-school vampire and zombie horror. Grab your bowl of popcorn and read Storberry with the lights low. When I wrote Storberry, I wanted to recapture the magic of the vampire horror my generation grew up with – Nosferatu, Salem’s Lot, The Hammer Films. Back in the day when monsters were monsters and vampires were to be feared, a good horror movie was an unforgettable night at the Drive-In. I hope when you read Storberry you feel like you are at the Drive-In, a big tub of buttered popcorn at your side. Or perhaps seated around the campfire, sparks popping off the bonfire like fireworks, the eerie glow of the moon, and the chirring of crickets, as I tell you the story of the little Virginia town called Storberry. My debut novel is the culmination of six months’ worth of writing and three drafts – a labor of love. Thank you to all of my family and friends who stood behind me in this effort and encouraged me to reach for my dreams…or in this case, nightmares. Enjoy Storberry and let me know what you think. Just a reminder. If you want to be the first to know about my latest writing projects and novel release dates, then you should absolutely sign up for my email newsletter. Be a part of our growing horror community! Congratulations Dan, I happened upon the news by shear accident but I am happy for you. I will give it a read and let you know.. Thanks Chris. Looking forward to your book, too! Huge grats on the book! Just picked it up today-perfect night to start it with a thunderstorm rolling in and a late night to fill. Thank you Ken. I hope you enjoy it! When you finish, please leave an honest Review on Amazon. Reviews are very important for getting indie authors recognition. A worthwhile, light read that is exceptionally good at drawing the reader into the mood of the tale. Overall pacing was great at building the story and ramping the anticipation of the reader. Too, this was a refreshing return to vampires at their best-bestial and frightening. There are, thankfully, no glittery love triangles here. Whether intentional or not I was pleased to see a few couched lines like “last in line” and “kill the king” within the verbiage of the text perhaps as a tribute, or perhaps noting more than coincidence. 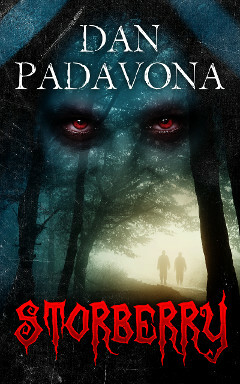 I read a lot of both established authors as well as new, independent writers and have to say I was pleasantly surprised at the outcome of Storberry and will definitely be on the lookout for more by Dan Padavona. Sounds really great. Definitely going to give this a read. Thank you Jade. I hope you enjoy Storberry.